Move Seattle levy: Better bus service or a bunch of ‘guesstimates’? Seattle officials promise to make seven bus routes move through crosstown traffic faster, using property-tax levy dollars. Opponents say those are merely lines on a map. Six years after light rail reached South Seattle, the old-school Route 7 buses a few blocks away remain relevant as ever. Some 13,500 riders a day slog through the congestion, because the bus, with its frequent stops along Rainier Avenue South, gives customers the closest thing to a door-to-door trip. The downside is that afternoon runs take an hour, if the bus stays on schedule and there’s no crash ahead. The long rides to Rainier Beach, and other places across the city, would become speedier and sleeker, city leaders promise — if voters approve the nine-year $930 million Move Seattle property-tax levy on this fall’s ballot. The levy also would fund street maintenance, sidewalks, bus stations, bikeways, safety and other work. Seattle’s nine-year, $930 million property-tax measure, also known as Move Seattle, would fund street maintenance, sidewalks, bus stations, bikeways, safety and other work. The estimated cost is about $279 yearly on a midpriced, $450,000 home, about twice the bill for the expiring Bridging the Gap levy. Ballots were mailed to voters last week and must be postmarked by Nov. 3. City officials say that if Proposition 1 passes, six major bus routes would be upgraded to RapidRide lines. Improvements would include bus-only lanes, signals to give transit a head start, ORCA fare-card readers on the sidewalk, arrival-information signs and Wi-Fi, on distinctive red buses. In addition, a new Madison Corridor bus-rapid transit (BRT) route would be established in its own lanes. These seven routes now serve more than 60,000 people daily. Thousands more ride buses that run along parts of the same corridors. Jaishad Woodiest, a Cleveland High student riding the 7 last week, thought RapidRide would be a great move, especially if there’s Wi-Fi aboard. But many details aren’t known yet, such as how to squeeze bus lanes into the gridlocked University District, fit larger bus stops next to small businesses along Eastlake Avenue East, and choose where to keep or remove curbside parking throughout the city. As of last week, the Seattle Department of Transportation (SDOT) said it’s not ready to release a spreadsheet of cost estimates and launch dates. The levy descriptions call for $104 million to improve bus performance, part of an overall $166 million transit-related share of the package that includes planning money and light-rail-station improvements. SDOT’s long-term outlook is for vehicle registrations to stay flat while the population grows quickly, said Director Scott Kubly. That suggests a future where the city tackles growth by preserving streets and improving other travel options. “Many of our existing arterials were built 60 years ago. They have not kept pace with our growing population. We are overdue to re-engineer how we as Seattleites move about the city,” Mayor Ed Murray said at the campaign kickoff last month. Ballots in the all-mail election must be postmarked by Nov. 3. When the Let’s Move Seattle campaign brochures mention “congestion relief,” that chiefly means reducing delay for buses. “The more reliably they can get through our crowded streets, the more attractive they become, and the more people will ride them,” said Seattle City Councilmember Tom Rasmussen, chairman of the Transportation Committee. Except for signal re-timing, proposed in five corridors per year, relief for motorists would be minimal. Murray hopes to build on the success of the city’s three RapidRide lines, where ridership has increased 49 percent in three years compared to the conventional buses they replaced. The E Line on Aurora Avenue North, the D Line from Ballard to downtown, and the C Line from West Seattle carry 35,820 daily. SDOT seeks to go beyond RapidRide in the Madison Corridor BRT project, costing $98 million to $120 million, where buses would become the primary users of the street. New buses would feature electric power poles, more interior space and doors on both sides — to allow for stations in the median. Center stations could reduce conflicts between buses and turning cars. As Rainier Avenue shows, establishing more RapidRide lines on arterials may be tougher than on the C, D and E lines, which run partly on six-lane roadways. In most stretches on Rainier there are two general lanes each way, and a recent safety project shrunk it to one general lane each way, at a 25 mph speed limit, through the Columbia City retail core. Pedestrians can show up anywhere, as well as cars nosing out of driveways. Whether buses should even go faster is debatable. Meanwhile, SDOT is gradually installing rider-friendly features along Rainier, such as short bus-stop pockets, wide sidewalks and electronic signs, aided by the expiring Bridging the Gap levy. City budgets show $9.3 million for transit-related capital improvements this year, dropping to a proposed $7.25 million if the levy fails, at a time when the city wants to accelerate work. 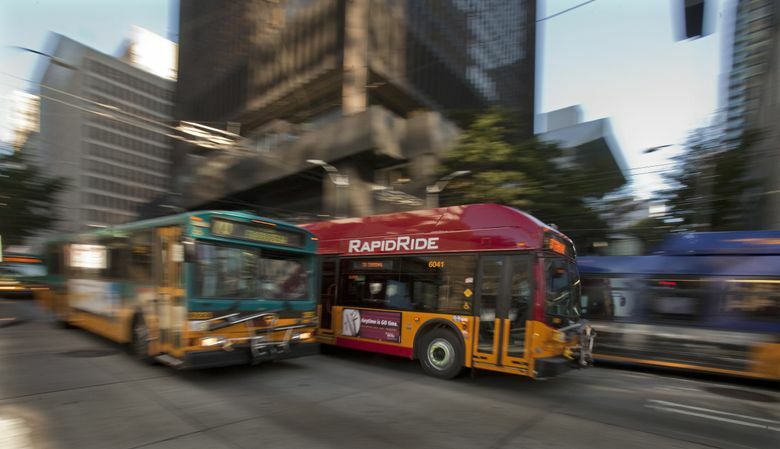 If the measure wins, the city predicts federal grants will effectively double the local investment in RapidRide. “If you pull the levy funding out of SDOT, a lot of the projects would take a heck of a lot longer,” Rasmussen said. The levy plan the City Council sent to the ballot proposes $4 million to get started on an ambitious safety project, costing $10 million to $20 million, at the Mount Baker light-rail station. 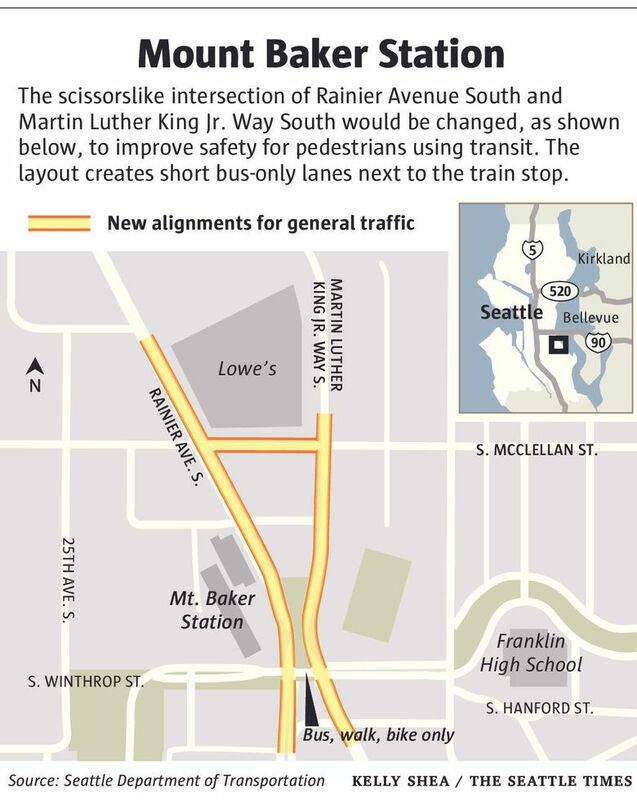 There, Rainier Avenue and Martin Luther King Jr. Way South converge like scissors in a crash-prone intersection. The two roads would be separated, with a leafy plaza between them, to create safer walking paths near Franklin High School and future high-rise housing. Curbside transit stops would replace today’s concrete bus basin, which sits on the opposite side of Rainier from the Sound Transit train platforms. Sound Transit opened light rail in 2009 without a stop to serve this low-density neighborhood, where the Columbia City and Othello stations are 1.7 miles apart. Neighbors and service groups gathered 1,241 online-petition signatures urging the city to act. Shefali Ranganathan, deputy director of the pro-levy Transportation Choices Coalition, said a train stop would create new travel patterns and redevelopment. The Filipino Community of Seattle, located nearby, has proposed an urban village to include 70 units of affordable senior housing. Murray proposes a $10 million contribution toward a stop at Graham Street, where he campaigned last week. However, an actual light-rail station requires that regional voters pass Sound Transit 3 tax increases next year. City fact sheets say the levy includes $15 million for a bike-walk crossing I-5, to connect North Seattle College and apartments to future light-rail that arrives in 2021. The campaign maps irritate state Rep. Gerry Pollet, D-Seattle, a bridge advocate — he thought it was a sure thing already, so why lead voters to think they must vote yes to get a bridge, considering the other committed funds and funding sources available.? “Has the city broken its commitment to fund the bridge, which was in place regardless of this levy?” Pollet said. State lawmakers this year committed $10 million, while the City Council and Sound Transit each committed $5 million to the bridge, plus $5 million to other walk and bike projects. And SDOT applied for a matching $15 million federal grant toward a $26 million bridge. Overall, the city’s specific project lists are not mandatory, the ballot ordinance says, though it does call for certain kinds of projects. Conditions can change over nine years. Wasserman said the transit plan is so undeveloped that SDOT should have limited the levy to street maintenance, earmarked for $385 million. “They should have left the other stuff for a year from now,” he said. Unlike a bridge or tunnel, SDOT’s street-level transit programs have the advantage of being small-scale enough that they can be delivered piece by piece. Even if cost overruns or lawsuits get in the way — or the city simply overpromised — levy dollars could still fund most of the transit corridors, or parts of every route.